Noel | Pony Ornaments Figurines | One Price Low Flat Shipping! From the Trail of Painted Ponies 2009 Holiday Collection, Noel. Made of resin. Measures 2.5" tall. 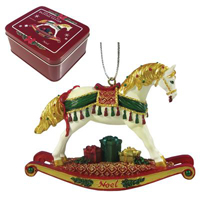 Packaged in decorative collectible tin container.<p>Delightful rocking horse ornament painted snow white with yuletide accents of a red blanket, a golden tail with colorful flecks and matching gold mane, along with green regalia. The base is decorated with beautifully wrapped gift boxes!